MADRID, Nov. 28 (Xinhua) -- China and Spain agreed on Wednesday to build on the 45th anniversary of the establishment of diplomatic ties to jointly promote the development of the relationship and deliver more benefit to the two peoples. The consensus was reached at a meeting between visiting Chinese President Xi Jinping and Spanish Prime Minister Pedro Sanchez. Xi said he was very glad to visit Spain for the first time after his re-election as Chinese president in March. Since the establishment of China-Spain diplomatic ties, bilateral relationship has withstood changes in the international landscape and enjoyed a healthy and stable development, he said, noting that the friendship has stayed as strong as ever. 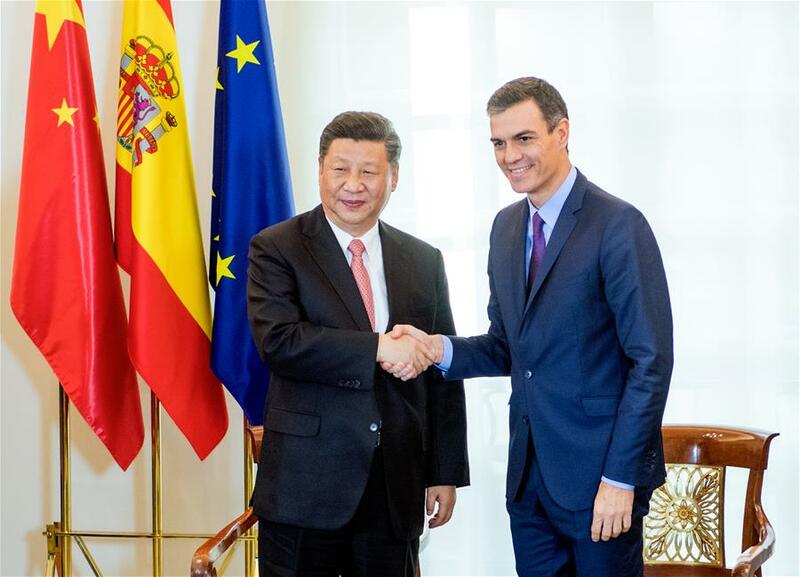 Praising Sanchez's endeavor to develop bilateral relations and his support for the Belt and Road Initiative (BRI), Xi said China always cherishes the traditional friendship with Spain and highly values Spain's important role in international affairs. China is willing to "work with Spain to enrich the content of China-Spain comprehensive strategic partnership, uplift the level of cooperation in various fields," so as to set an example for different civilizations to communicate and learn from each other and for countries with different social systems to achieve win-win cooperation. Xi stressed that the two sides should strengthen the "guiding and driving" role of high-level exchanges in the development of ties, cement exchanges and cooperation between the two government departments and legislative bodies, deepen political mutual trust, and continue to extend mutual support and understanding on issues concerning each other's core interests and major concerns, so as to forge ahead the steady development of bilateral ties. "There are multiple advantages including historical and geographic factors for China and Spain to conduct cooperation on the BRI," said Xi, calling for greater synergy between the BRI and Spain's "Strategic Vision for Spain in Asia" and the "Mediterranean Corridor", closer economy and trade contacts, and more cooperation in such areas as ports, shipping, aviation, new energy vehicles, finance. Xi also called on the two sides to optimize technology and innovation cooperation, deepen people-to-people exchanges, and strengthen exchanges and cooperation in culture, local areas, tourism, journalism, medical care, cultural heritage protection, and sports. China stands ready to maintain communication and coordination with Spain on improving international governance, tackling climate change and other global and regional hot issues, Xi added. "China supports the integration process in Europe. China and Europe should support each other and strengthen collaboration in jointly safeguarding global order and promoting global governance," said Xi. "We are willing to seek greater synergy between the BRI and Europe's development strategies, jointly advance Eurasian interconnection and promote development and prosperity of the Eurasian continent,"said Xi, expecting the Spanish side to play a positive role in this regard and safeguard the correct direction for the development of China-Europe relations. For his part, Sanchez said that Xi's visit is of great historic significance and will open a new era for Spain-China relations, as it is the first visit by a Chinese head of state to Spain in 13 years and coincides with the 45th anniversary of the establishment of diplomatic ties between the two countries. Hailing the "satisfactory" development of bilateral ties, Sanchez said Spain and China have become important trading partners, with increasingly closer cultural and educational exchanges. The Chinese in Spain have also made positive contributions to Spain's development and the friendship between the two countries. Under the new situation, Spain stands ready to increase political mutual trust and expand exchanges and cooperation with China. And Spain will actively take part in the construction of the Belt and Road, which is of historic significance, said Sanchez. Sanchez said that Spain firmly supports multilateralism and has similar positions with China in international affairs, expressing the will to closely communicate and coordinate with China, in order to promote the healthy and stable development of Europe-China relations. After the talks, the two leaders watched the signing of a number of bilateral cooperation documents in areas including culture, economy, people's livelihood, advanced materials, telecommunications, third-party markets cooperation, education and finance. The two sides also issued a joint statement on strengthening comprehensive strategic partnership in the new era. Before the talks, Xi was welcomed by King Felipe VI with a grand ceremony at Plaza de la Armeria next to the royal palace. The Chinese president was also conferred with a golden key to the city of Madrid by Mayor Manuela Carmena at a presentation ceremony held in Madrid City Hall. Noting that her citizens have been fond of the Chinese Spring Festival and recognizing the close ties between Madrid and China, Carmena said she looked forward to more cooperation between the Spanish capital and China. Xi said that Madrid became a friendship city of Beijing back in 1985 which injected vigor into every field of cooperation between the two countries. Delighted to accept the golden key, he said it will carry forward the close friendship between China and Spain and hoped the doors of mutual exchanges will open even wider.